I am sitting on couch - which is pretty much my 18hour a day occupation- and came across a blogable fact History of the Pineapple Lump. With the possibility of a family (albeit extended family) link this is definitely worth sharing. Anyway the part of story that will appeal to Tim and Stacey in particular is that the reason for the lump being created was to use up leftover marshmallow from chocolate fish production. Charles Diver - the chef and floor production manager at Regina confectionary and possibly a Diver from Bernie's family? ?- didn't like waste and eventually took the banana flavoured marshmallow changed it, added chocolate coating and came up with Pineapple Clump. 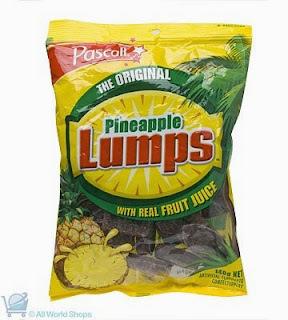 Marketers changed name to Lump and new NZ legend born. So next time you are passing through Oamaru (wonder when that might be?) raise a cheer for the pineapple lump. And we must find out from Bernie if Charles is part of his family - if so we can claim the Pineapple Lump as our own! !